Acer has announced the Aspire easyStore H341 NAS, offering up to four hot-swappable HDDs to store and stream your digital media. The Aspire easyStore H341 is designed to store, organise and protect your entire digital media library, and make it accessible not only through computers but also consoles and other DLNA compliant devices. "What's more, with the new Aspire easyStore H341 you can stream digital media content to multiple applications or DLNA compliant devices, such as console games or TV, making it possible to share games from the server or enjoy music, photos and movies on a big screen TV," adds Acer's release. Acer has tried to make adding HDDs easy, and the device is driven by an Intel Atom D410 chip. 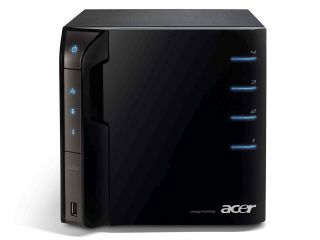 "Uploading pictures, video or data files on the Aspire easyStore is easy, too," adds Acer's release. "All you need to do is connect the device through the USB port and press the Copy button. Data is automatically sorted and stored by file type into folders of your choice." The data can be got at through the internet (as you would expect) with a "user friendly web interface" allowing you to connect to your content from anywhere.